Please read the entire auction listing, including shipping costs, before writing to ask a question. OUR GOAL IS CUSTOMER SATISFACTION. In order to meet that goal, we will ALWAYS work with our customers on any concerns that may arise. In theunlikely instance that you feel the need to open a resolution dispute before working with us, you will immediately be blocked from any further chance to acquire the rare music we present each and every week. Payment is required within seven days. We mail all paid items ONE WEEK after auctions end. Please keep in mind our listings are time consuming in detail and we are often traveling to find these gems, which at times delays the delivery schedule by a day or two. We ALWAYS process and ship every paid order. We have no control over parcels once they are mailed from our local Post Office. Overseas mail to some countries (Italy, Russia, France, in particular) has became very slow. Opening a dispute for slow mail is unacceptable and will result in blocking the bidder. We work hard to provide excellent service as is represented by our 8000 plus positive feedback. We use a VPI machine and thoroughly clean all records. Each order is carefully packaged by removing the LP from the jacket to avoid seam splits, use of 3 ml plastic cover sleeves over each LP and jacket, cardboard pad inserts, and placed in sturdy record mailers for safe delivery. We take Customer Service seriously, and want you to be satisfied. Please give us 5 stars in each category through the feedback system, and we will be able to effectively continue to fulfill your passion for rare and collectible music! We have served thousands of satisfied customers - far more than our feedback records indicate - and our aim is to continue to do so. Priority rates vary by area; please inquire. Discount shipping on multiple LPs in same order. Note to International buyers: If you are unable to bid on our auctions, send us an e-mail and we will fix your problem. WE DO NOT USE EBAY's GLOBAL SHIPPING PROGRAM. Be certain that your Customs forms are processed by us and your package will be postmarked and mailed at our local Post Office. 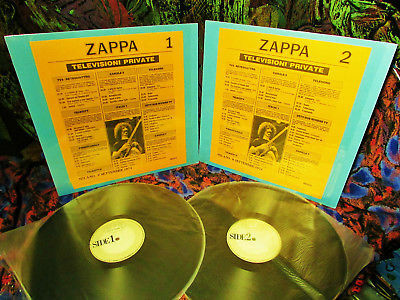 The DOUBLE VINYL SET are actually weight heavy ACETATES that apparently were shelved, the project never issued as planned and remaining absolutely impossible to ever hope to find another set... As far as we can tell only one copy was ever offered on eBay, years ago.